….Until the end of time. Jesus’ words are embracing me today. Mounting medical and cost of living bills added to our decreased income and other familial woes are giving me a sense of frustration I have not known in years. For the first time in my life, I broke down crying with the billing office of Aurora Medical–we have such a pile of bills from them and several other doctors and pain clinics for my husband’s medical issues and lately, from my own. I told a woman who probably didn’t care, that coming up with their idea of a workable payment plan just wasn’t going to fly because we can no longer afford to purchase groceries. To her credit, she was kind, but there was little she said she could do. Honestly, I understand her position, after all–they need to pay the staff for their services, just as I want to be paid for my own. What is difficult is that these bills are for the most part from a personal injury my husband sustained at a store 4 years ago and they are simply not our fault. But again, the doctors still need to be paid. While we live frugally, it doesn’t seem to be enough for us as we are trying to juggle living on social security disability coupled with my wavering freelance income. It’s hard juggling all the plates and today, I just want to pull the covers over my head, go back to bed and pray that it all goes away. However, the mounting medical bills, my son’s school tuition, cost of living expenses, and basic necessities will not go away. I am beginning to feel the familiar sick, churning mass in my stomach as the holidays encroach and we have nothing to give as gifts. In short, we need a miracle or we will lose it all. It isn’t as if I am not working hard, I am–but it isn’t enough. I could work 24 hours a day and it wouldn’t be enough to get us out of this mess and I want to wave the white flag, climb in a hole and give up. But in the midst of my wallowing in self pity, I feel the sliver of warmth into my heart telling me to hold tight, for better days are coming. I don’t know how, but I just know in my soul that somehow our Lord will get us through this. It is up to me to be patient and remain faithful to Him. I have to focus on the fact that He is a God of miracles, and He will give me the grace to overcome this impending disaster, and He will find a way to help me get those bills paid. I just need to pray more. If I take this struggle and turn my face towards the Light, and have faith, I know somehow, all will be ok. I know that God’s love and the Holy Eucharist is all we really need anyway and it is my own flesh that is suffering, I have to be about the eternal and believe that in the end, all that will matter will be our closeness with Him. 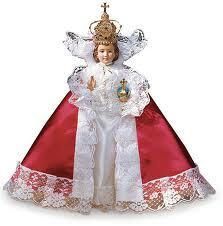 One way that comforts me is to pray a novena to the Infant of Prague for strength and a miracle. (Make your request) O Jesus, Who has said, “All that you ask of the Father in My Name, He will grant you,” through the intercession of Mary Your Most Holy Mother, I humbly and urgently ask your Father in your name that my prayer will be granted. (Make your request) O Jesus, Who has said, “Heaven and earth shall pass away but My word shall not pass away,” through the intercession of Mary Your Most Holy Mother, I feel confident that my prayer will be granted. (Make your request) PRAYER OF THANKSGIVING Divine Infant Jesus, I know You love me and would never leave me. I thank You for Your close Presence in my life.